Image: Richard Ditch, 2007 [larger view]. Please name at least one field mark that supports your identification. This bird’s downy plumage may not identify it to species, but it leaves no doubt that we are dealing with a very young bird — a chick, in fact. The long legs and bill, and the fact that it is standing in water, tells us that this is a shorebird. 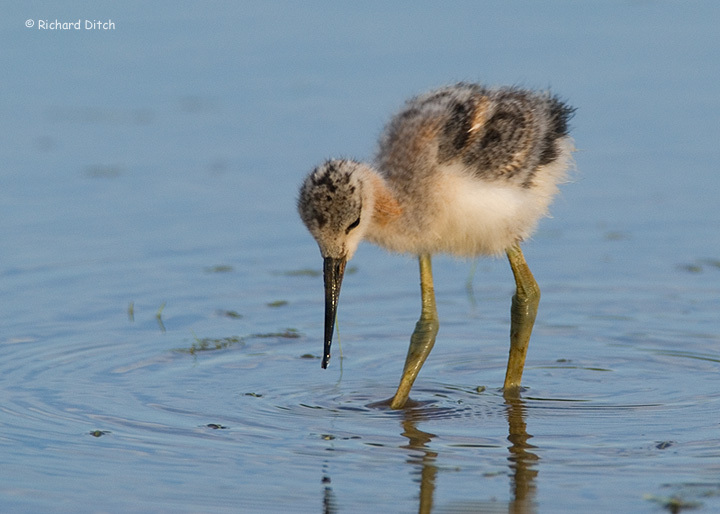 Adult shorebirds are best identified by shape and structure, and the same goes for their young. The legs and feet of this bird are long and noticeably stout, with a thick ankle joint. The bill is very strange: relatively massive at the base, then tapering quickly to a fine and ever so slightly upturned tip. That last character puts us onto the correct identification, one that a quick examination of the bird’s plumage confirms. Note the three dark “stripes” on the upperparts; compare that with the wing pattern of a fledged American Avocet. The hint of warm cinnamon on the side of the neck also presages the rusty neck of a juvenile avocet. Review all mystery birds to date. This entry was posted in Birding, Mystery Birds and tagged American Avocet chick, bird ID quiz, bird watching, birds, image, mystery bird, ornithology, photo, photography, picture, Recurvirostra americana. Bookmark the permalink. I’ll go with American Avocet chick because of the slightly recurved bill. The dark line behind the eye is just visible as well. I’m inclined toward Greater Yellowlegs – curve in bill also applies, and the legs are, well, yellow. My guess is a very juvenile American Avocet. I note the pink colour on the neck, the relatively long legs, and the slightly decurved bill. Also, given that it was taken in Arizona, I cannot think of any other wader with the same basic shape in that range. I’ve never seen a Yellowlegs chick but that would be my guess. I’m guessing the leg coloring is important. The fact that the bill is quite stout at the base probably means it has a way to grow. Therefore, I’m going with Hilary and saying Greater Yellowlegs. I also vote American Avocet chick, because of the other things mentioned as well as the orange coming in on the neck. A Guide to the Nests, Eggs, and Nestlings of North American Birds (2nd edition) by Paul J. Baicich and Colin J.O. Harrison. FYI: Greater Yellowlegs DON’T breed in Arizona! Clearly this is a newly hatched youngster in Arizona. Both Yellowlegs breed only in northern Canada and Alaska according to Dennis Paulson’s shorebird books and the National Geographic Guide, while the Avocet “breeds throughout the west–south throuogh Mexican Plateau”. It must be an Avocet! This is obviously a newly hatched shorebird in Arizona. According to Dennis Paulson’s shorebird books and the National Geographic Guide, both Yellowlegs breed in northern Canada and Alaska. The Avocet, on the other hand, “breeds throughout the west–south through the Mexican Plateau”. This must be an Avocet!